So … I was sent this delightful package from RE.SKIN. A bespoke two-step skincare system tailored to rejuvenate and restoreskin back to its optimum state. YEEHAA!!! Praise Be!!! There is hope for me yet. This is very very exciting and as I am in the industry of getting people WEDDING/EVENT and DAY to DAY READY, I have been delighted to find a product that can give a GLOW from the inside to the outside. “HOW DO I GET MY NAILS strong", HAIR shiny and a gorgeous SKIN GLOW pre, during and post my event and of course, every other day?” - I get asked this ALL the time. Also, these days as people are time poor and over complicated skin care regimes can be a right pain…. to have a two step skin and nutritional programme in 2 easy steps - I think is the BOMB!!! This definitely ticks all the boxes. Your skincare regime shouldn’t feel forced - it should work around you! What I really like about their philosophy is; they have redefined skin care truthfully, the formulas are highly potent and actually work, and no ingredients have been compromised…. IT IS HONEST & SIMPLIFIED… excellent for a busy person. With research at its heart, RE.SKIN sees skin differently. Your skin is capable of great transformation with consideration and nourishment. Why not start this and see the results. 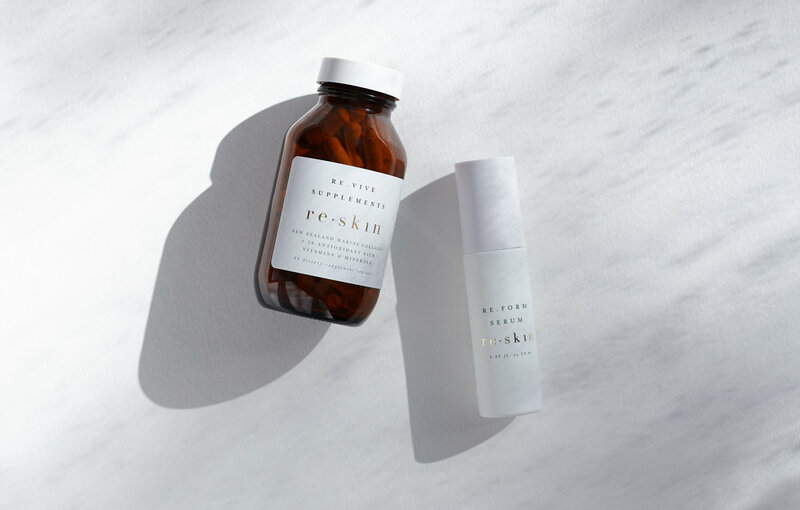 This is a milestone in anti-ageing, combining powerful botanicals with proven science, re.skin’s stripped-back skin formulas are free from chemicals and fillers. From re.skin’s rich understanding of natural actives and appreciation for functionality, flows forth a gold-standard skin duo to nourish the skin at its deepest level. Fortified with 10 active ingredients and 10 nutrient-rich plant extracts. The concentrated serum, fortified with three powerful actives and 10 nutrient-rich plant extracts, delivers multidimensional anti-ageing properties, which penetrate deep into the skin, restoring radiance beyond the surface. Using only premium ingredients and enveloped in a 100 per cent natural botanical fragrance, this serum will help stimulate skin cell turnover, improve elasticity, restore luminosity and fight free radical damage.